Robert is a student at Lawndale High and a football player in the Lawndale Lions, drawn as tall and broad-shouldered. His one claim to fame is that, technically speaking, he was Daria Morgendorffer's very first date ("The New Kid"). Robert has brief speaking parts in "Daria!" (in a chorus), "Murder, She Snored" and "I Loathe a Parade." He is a silent background character in "The Lawndale File", "Mart of Darkness" and "Groped by an Angel." In his debut in "The New Kid", Quinn sets him up with Daria on a double date - his payment being "you like sitting at the other end of our table, right?". Quinn hoped to get her in a good mood so that she will agree to give sports and clubs more pages in the yearbook. 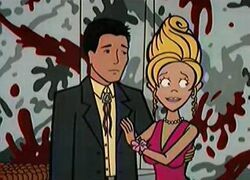 (The cover story was going to be that "I know this cute guy who's got a huge crush on you" - Daria immediately assumed this was a trick and the cover story changed to a chaperone date getting her curfew extended) Robert brings a set of note cards with "smart" conversation topics along with him, but when he asks about the yearbook Daria gets angry and exits the car. Daria notes she was suspicious when he kept calling her "Darcy". In punishment, Robert has to sit somewhere else at lunch for the next week. Later, Robert tries to hassle "Darcy" and Ted at the arcade, though he can't remember why he thinks he needs to do this. ("I think it's important.") When Ted beats him in a sword-fighting game the two wind up bonding (along with all of Robert's bros) and basically forget about Daria entirely. By the next day, Ted and Robert are firm friends. Robert's other main role was in "Daria Dance Party," when Kevin and Brittany go through a temporary break-up. Kevin makes the other football players agree not to date her, but Robert had been on vacation at DisneyWorld and did not know this rule, so Brittany invites him in order to make Kevin jealous. The two have a bad time - first because Kevin wasn't around to get jealous and then when Brittany finds out from her friends he dances like "a big geek" - though Robert tries to console her. ("I got you the wrong color corsage, didn't i?") However, when Kevin finally arrives Brittany begins kissing Robert, inflaming Kevin's jealousy and making him attack Robert. The latter seems to win the fight, as the episode ends with Kevin being taken to the hospital. In "Murder, She Snored", Robert (along with the rest of the team) cheats on a History test and covers for Kevin, who stole it. He seems unbothered about getting an F.
Robert plays football for the Lawndale Lions. He is one of Quinn's boy toys, doing whatever she asks of him. Polite and well behaved around women, he frequently addresses them as "ma'am." Around males, especially his friends, Robert likes to roughhouse. The cheerleaders think he is a bad dancer ("Daria Dance Party"). By nature Robert appears to be friendly, well mannered, chivalrous, and emotional. He is physically powerful (he broke Kevin's jaw in "Daria Dance Party"), but rarely goes looking for trouble. His incompetence at fulfilling even moderately complex tasks could presumably be traced to his dull intellect or hazy memory. Predictably, per the TV series, he often calls Daria "Darcy" and says "ma'am" to all women. His primary interests seem to be football, dating girls from the Fashion Club, and screwing up to provide comic relief. Alternate universe versions of "The New Kid" will feature him, naturally. Electronic Alchemy: On This Night, A Star Is Born by The Alchemist explains his politeness with: "I went to Military School until I was thirteen," says Robert, explaining why he is so polite. Occasionally he is called upon as a romantic figure - dating Daria again in Dennis' "Turnabout Confusion", dating a fed-up Stacy in Canadibrit's "The Look-Alike Series" story "Display Model", dating Quinn in Lawndale Living Conditions & Week of Hell by Thomas - or as an ally to the protagonists, such as being an FBI agent in TAG's "Darkness" or assisting in the all-out brawl in ep22 of "God Save The Esteem". 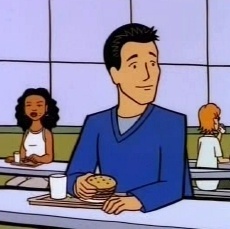 A trope buster for this was Kara Wild's Tomorrow Never Knows, where he and the football team threaten Daria with trouble for causing a store to drop its sponsorship of them. A number of fans assume that Ted is gay and have latched onto Robert as the most common male to pair him with, as in OverlordMikey's "One More Round." This trope has been subverted in The Excellent S's Lawndale Fighting Championship series where, teamed up as "Da Nice Guyz", they act comically friendly to each other and colour commentator Janet Barch implies that there is more to their relationship. This page was last edited on 6 May 2018, at 03:30.